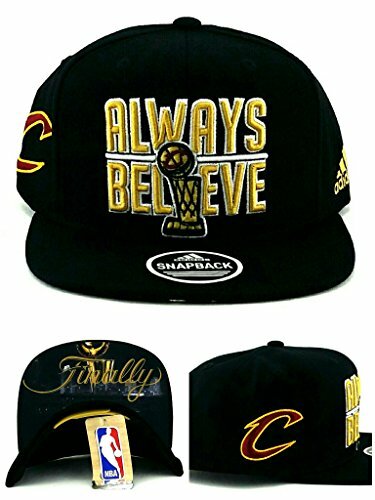 Adidas Cleveland Cavaliers NBA Always Believe Trophy Snapback Hat. Great look with Always Believe with Championship Trophy on a Black Crown. Adidas Logo on Side, Cavaliers Logo on Other Side. Skyline of Cleveland on UnderBill with Finally going through it. Size - One Size Fits Most Dad Hats like these normally retail for $34.99 - 39.99 plus shipping, you can take advantage of this one for only $24.69!!! Hat has all logos and letters embroidered, stitched on. Great item for the true Cavs Fan... Let's Go Cavaliers!! !